The steamdrill, a nineteenth-century machine that lacked an on-board computer, much less a human-computer interface, understandably, if tragically, failed to answer John Henry’s questions. If only the steamdrill had been equipped with advanced robotics technology, the rock-drilling competition might have been avoided. A collaboration might have been arranged instead, giving John Henry the opportunity to demonstrate his jack-turning and track-laying versatility. Also—and this is no small detail—John Henry would have survived. In the hundred-plus years since John Henry beat the steamdrill only to die from overexertion, machines have evolved. Instead of brute-force, single-purpose machines, we now have software-driven instruments that are modular and flexible—so flexible, in fact, that human-robot collaboration is becoming a reality. Such collaboration is especially welcome in the life sciences, where progress slows if highly trained and insightful scientists are obliged to spend inordinate amounts of time pipetting liquids, entering data, and carrying out other mundane tasks. HighRes Biosolutions pushes the boundaries of what’s possible in high-end lab automation. It uses a modular, plug-and-play approach in which automation solutions are tailored to each customer’s science. This realization prompted HighRes Biosolutions to take a different direction. The company developed a vertically integrated system with a small deck and dynamic trays that move back and forth, with a high volume storage carousel under the deck for labware. Devices and informatics are fully integrated into the system. 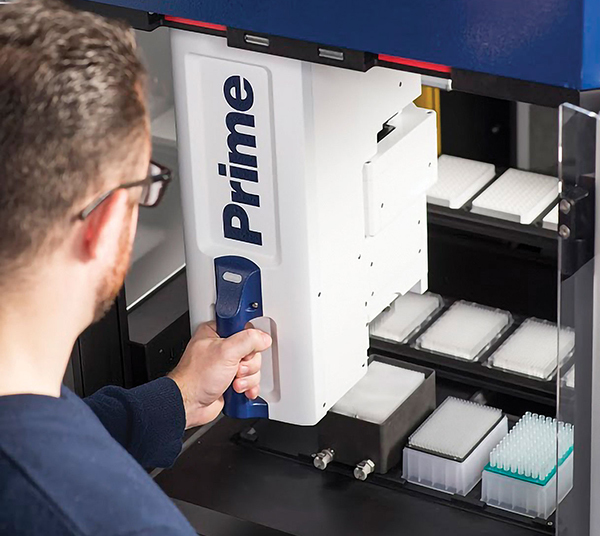 Prime delivers continuous pipetting and is labware agnostic. Rather than dominating the benchtop, Prime stands next to it, using vertical storage to optimize lab space. “It’s hard to overstate how different it is,” Harris declares. 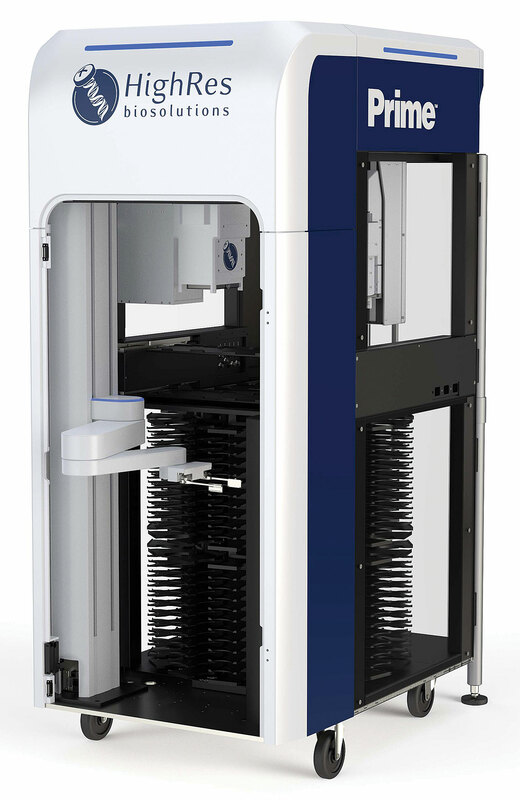 Prime is a vertically integrated liquid handler that incorporates collaborative robotics, a dynamic tray-shuttling deck, and a storage-carousel underdeck for labware. Prime can be used as a standalone device or docked to a large system. HighRes Biosolutions was founded in 2004 by Lou Guarracina, an engineer and administrator experienced in the development of robotic systems for life sciences research and drug discovery. He had served as director of automation at Massachusetts Institute of Technology and Harvard University after a decade of hands-on automation work in pharma, including five years at Novartis. Even before HighRes Biosolutions was launched, Guarracina had been active in high-throughput screening, which was still maturing. Also, he had been experimenting with docking as a way to advance modularity in lab automation. Then, by chance, he was approached by a large pharma company that asked if he could design a modular automation system, one that could easily adapt to different tasks. “We would have one order for $4 million, but then would have a time lag before the next order,” he continues. “Once we started delivering systems, however, customers wanted us to help iterate them.” At that point, the HighRes customer base solidified, and the company began thinking about managing resources and expanding the areas that could be automated. “Today, we prioritize our technical direction,” Harris says. “We’re getting ready to leap forward to capture additional market share in the liquid handling market, and then to push into other areas that can be automated.” Chromatography, mass spectroscopy, chemistry, and cell culture are all areas of opportunity that currently have limited automation technologies on the market. Deep awareness of customers’ challenges and the automation landscape informs everything HighRes Biosolutions does. For example, Harris points out that for automation projects to perform optimally, automation should be grounded in a thorough understanding of how the existing lab works, how automation will change its workflow, and the likelihood that those conditions will change over time. Considering those three aspects, as well as the desired outcome, goes a long way toward improving the automation project. “Superusers understand this, but we also work with a lot of startups that are deploying platforms they perfected on the benchtop,” Harris says. “Often, there are layers of automation prospective users haven’t considered. Gaining that understanding can be harder than it sounds. “Most lab automation isn’t really modular,” Harris insists. “In the industry, ‘modularity’ means the vendor can assemble standard parts to build a system.” This kind of modularity, Harris suggests, may be too narrow to mean much to a user who ends up seeing a monolithic piece of equipment. Harris likens monolithic devices in the lab to robots in automotive assembly plants. Such robots are embedded in (and constrained by) millions of dollars’ worth of hard-to-change tooling. True modularity, he says, is plug and play. It allows a researcher to use one reader today for a group of assays, and a different reader tomorrow for a different set of assays. In this scenario, researchers can dock and undock readers easily, reconfiguring their automation systems at will. Life sciences work that used to be impractical will become routine when lab automation realizes collaborative robotics, an approach, Harris suggests, that will culminate in “robots working alongside people safely, without guarding.” Collaborative robotics, Harris continues, is favored by several mutually reinforced trends. For example, he sees opportunities in miniaturization. The size and volume of materials used for each experiment are decreasing, so the control levels and systems linkage for inventory management and data collection should be one seamless process, he says. That will bring true Internet of Things (IoT) capabilities to the lab. Ultimately, collaborative robotics may grapple with the kinds of questions posed by John Henry. It may, for example, find ways for machines and humans to accommodate each other, allowing machines to do what they do best, and humans to do what they do best. Collaborative robotics, then, is more about building teams than running races. Focus: HighRes Biosolutions develops modular high-end lab automation systems and instruments, as well as scheduling software, for the biopharma industry.